Clinton, Tennessee, February 20, 2014 – ITP Tire & Wheel Company today announced the launch of the all-new Mammoth Mayhem mud tire. an extra-deep, two-inch lug for maximum thrust through the deepest muck and mud. The mammoth-sized claws are designed to propel ATVs and side-by-sides continuously forward, while channeling the mud out of the tire tread. Durability is another hallmark of the Mammoth, according to the company. The 6-ply rated carcass is manufactured from an extended-wear rubber compound, which delivers long-lasting performance. The Initial size offering is 32×10-14. 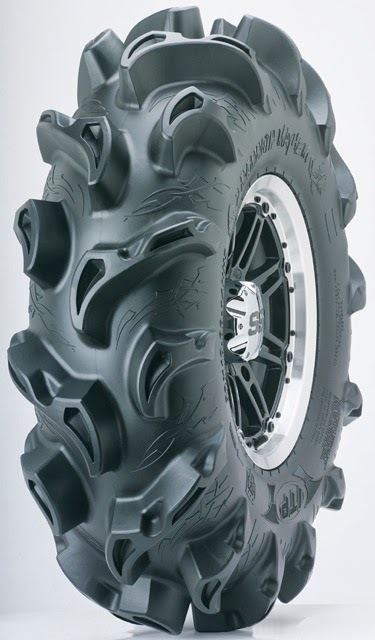 Other mud tires in the line include the Mayhem, featuring a one-inch lug; the Mega Mayhem, which sports a 1-1/2-inch lug; and the Monster Mayhem, which comes with a 1-3/4-inch lug. The entire Mayhem family of tires is proudly produced in the USA. The company said riders should find the new Mammoth Mayhem at their local dealers by mid-April.